Using a credit card debt calculator can help you better plan your debt management and payoff strategies. Below you will find two different debt calculators that you can use to gain more insight into your debt situation. Utilize these free tools as you formulate your overall plan to zero-out your balances and begin your path to living debt free. This first calculator computes the money you need to pay a given creditor each month to alleviate your balance over a specified period of time. It also shows how much you pay in interest along the way, which will likely be an eye-opener. Type in the money you currently owe on your card, the amount of purchases you continue to charge each month, the interest rate you are paying (replace the number that currently appears if it is different) and the time in which you want to pay off the card. eliminate my credit card balance ?" Similar to the debt calculator that appears above, the following tool provides the length of time it will take you to become debt free. Again, interest is calculated so you can determine how much you are paying on the principal and how much you are paying in interest... all for the privilege of using the credit card, which is an unsecured loan or cash advance. Fill out the form by inputting the balance that you owe, how much you continue to charge on the card each month, your interest rate, and the payment amount you plan to send each month to the creditor. my credit card bill in full." While using a debt calculator can help you in the planning process, you need to ensure you have the right debt management strategies in place to achieve your pay-off goals. The sections and articles on this site will shed light on your various options for taking control of your finances. 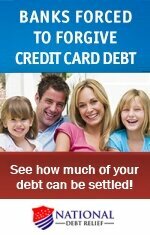 These include credit counseling, consolidating your credit card balances, and debt settlement. You can develop a plan on your own to tackle credit card debt or hire the services of a credit counselor or attorney to assist you. You'll find information on the pros and cons of each on this site, as well. Specific articles that may be of particular interest are listed below.